n January 1872, the Ryūkyū kingdom was informed that it had been affiliated as the Ryūkyu fief to newly established Kagoshima Prefecture. According to the regulations determined in a letter by Ōyama, the chancellor of Kagoshima Prefectural at the time, “Congratulatory Envoys for the Restoration of Imperial Reign“ had to be dispatched to the Imperial Meiji Court in Tōkyō. Chosen were Ie Ōji Chōchoku as chief envoy, Ginowan Uēkata Chōho as vice envoy, and Kyan Pēchin Chōfu as sangikan, i.e. diplomat ranking below the chief and vice envoys. They were accompanied by Yamazato Pēchin, whose role is unclear, as well as an interpreter for the Ryūkyūans when in Japan. Kyan Chōfu was the father of karate expert Kyan Chōtoku. 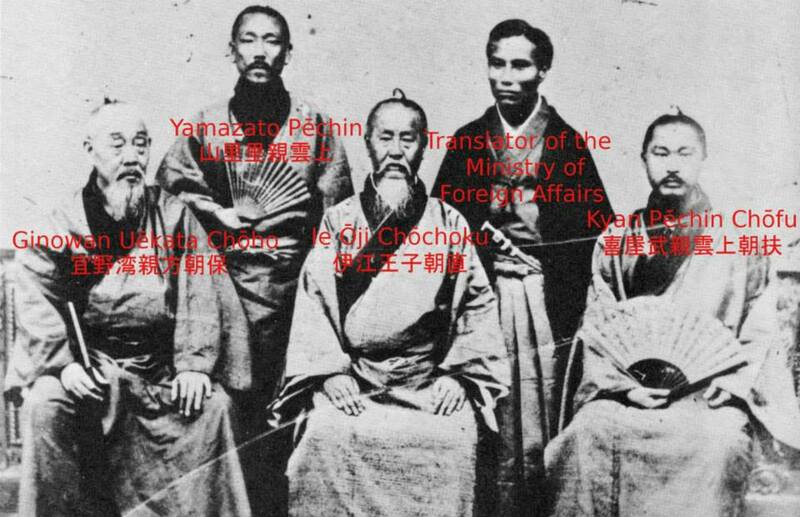 Kyan Chōfu was of Pēchin rank at the time of the embassy in 1872 and in this specific case on duty as a sangikan (not to be confused with the sanshikan or highest political gremium of the kingdom). While the house he belonged to in 1st generation was founded by the son of the 10th King Shō Sei, the 10th generation Chōshō passed away on 1837/07/23 without heir so that the head of household was inherited and continued by Chōchō, son of Motonaga Satonushi Pēchin Chōgi (see official genealogy of the House Kyan). Later Motonaga Chōfu was also adopted into the Kyan House and became Kyan Chōfu. Chōtoku was his 3rd son. from: Kishaba Chōken: Ryūkyū Kenbun-roku, 1914. The party reached Tōkyō on 3rd of September and visited the Imperial palace on September 14th. On this day the Meiji Emperor presented to them the investiture of Shō Tai as king of the Ryūkyū feudal fief (han-ō). By this act the exclusive authority for approval of the Ryūkyū King, hitherto held by Shimazu, was transferred to the Japanese Meiji Government. Of course, the real reason of this “Congratulatory Mission” was the preparation of the integration of Ryūkyū into the Japanese Empire. Kishaba Chōken: Ryūkyū Kenbun-roku, 1914. Sakuda Shigeru and Yanagi Kōkan: Karā Okinawa no Rekishi, Vol. I. Naha 1971. Andreas Quast: Karate 1.0, 2013. © 2013 – 2016, Andreas Quast. All rights reserved. This entry was posted in Kyan Chotoku, Misc, Unknown Ryukyu and tagged Ginowan Choho, Ie Chochoku, Ie Oji Chochoku, KARATE 1.0, Kyan Chofu, Kyan Chotoku, Shimazu. Bookmark the permalink.